A source defines a set of configuration parameters for a specific Zendesk customer service website. Select the connector used by this source. In this case, select Zendesk. Note: If you do not see Zendesk, your environment does not meet the requirements (see Zendesk Connector Requirements). Enter the base URL of your Zendesk customer service website. Select the field set that you created earlier (see Zendesk Connector Deployment Overview). Note: CES 7.0.7914 (October 2015) Keep the Every day option as the incremental refresh is not supported. (When you want the connector to retrieve your Zendesk content using a Zendesk API v2 token) Enter the API token to use that you previously obtained (see Authorizing the Coveo Connector to Access Your Zendesk Content). Note: This method is not recommended since the Zendesk API token allows read and write permissions. (When granting the connector access to your Zendesk content using OAuth 2.0) Enter the access token to use that you previously obtained (see Authorizing the Coveo Connector to Access Your Zendesk Content). The following options must be selected for certain Zendesk item types to be indexed. Whether the comments on tickets and articles should be indexed. Whether the users, groups and organizations should be indexed. By default, administration entities are not indexed. Whether tickets should be indexed. Whether the articles in the Help Center should be indexed. Whether the articles and their attachments should be indexed. By default, Help Center items are indexed. (Optional) Click Add Parameter when you want to show and change the value of advanced source parameters (see Modifying Hidden Zendesk Source Parameters). 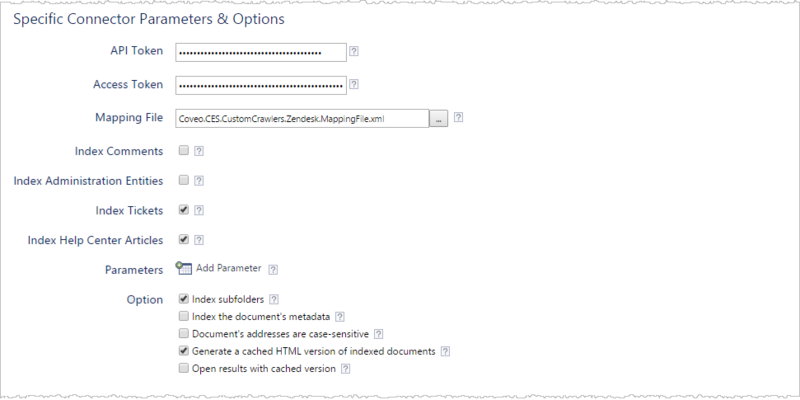 Important: CES 7.0.7914 (October 2015) The connector does not yet support Zendesk permissions. It is thus strongly recommenced to only index Zendesk customer service websites with public content. Note: A workaround is to manually define permissions on the source (see Permissions). When you grant the connector access to your content using OAuth, select (none). When you grant the connector access to your content using the Zendesk API, select the user identity you previously created (see Zendesk Connector Deployment Overview). CES 7.0.8047+ (December 2015) When you chose to index Zendesk permissions, in the Security Provider drop-down list, select the Zendesk security provider that you created for this source (see Configuring a Zendesk Security Provider and Permission limitation). Important: CES 7.0.7914 (October 2015) The connector does not yet support Zendesk permissions. 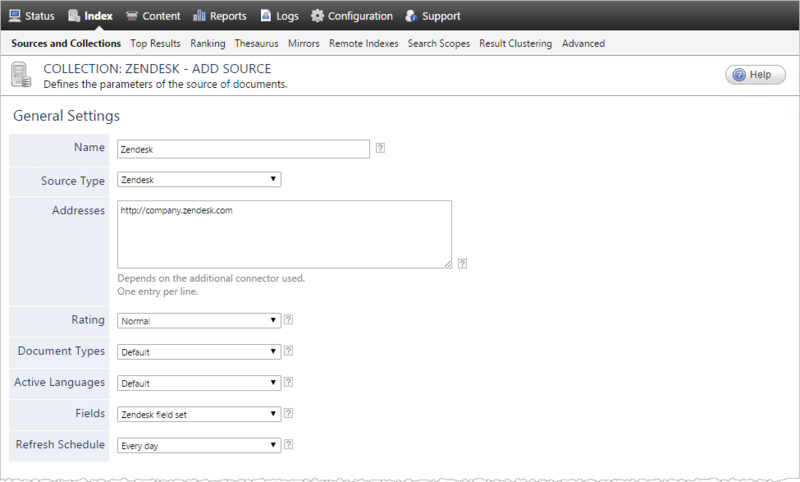 This means that, in the Coveo search interface, a user searching Zendesk content could see content to which he has normally no access in Zendesk. Since Zendesk APIs can only be used by Zendesk admin users, it is currently impossible to limit the content to be indexed to a certain organization, group, or user (agent and end-user). Note: When your Zendesk content is not public, a workaround is to enter the name of user(s) or group(s) you want to allow or deny access to your organization content in the Allowed Users and Deny Users boxes. When you are ready to start indexing the Zendesk source, click Rebuild. Consider modifying some hidden source parameters to try resolving other issues (see Modifying Hidden Zendesk Source Parameters).